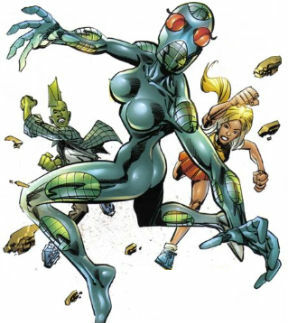 Insect was one of the many new Vicious Circle members that were brought into the group during the reign of Buster Justice. She was one of the villains sent to abduct Dragon’s children as a way of trying to get the hero to quit the Chicago Police Department. She then attacked Dragon when he was recovering in Hillman Hospital after the initial encounter with the man who would become Virus. When OverLord III sent an army of Vicious Circle villains to Hillman Hospital to steal the last remaining vial of Dragon’s blood, Insect was present. She was then targeted by Malcolm and Angel Dragon as they sought the location for the missing blood. They ended up defeating the woman and delivering her to the authorities. She is next seen when Dart II berates the VC for not finding Malcolm. She is part of the search party sent after Malcolm, but quickly flees after seeing her allies brutally murdered and beaten by Malcolm.